Higher Education institutions share a common need to allow for the exchange of core enterprise data between the systems and tools within their teaching and learning ecosystem. From student information systems that frequently serve as the system of record for personal and biographic/demographic data, course catalogs, enrollments, and final outcomes—to learning management systems that not only need much of that same data but house their own details like assignment level grades, class participation, and connections—to a host of learning tools, library systems, housing, parking, and card services—data needs to be easily and efficiently exchanged on campus. Getting systems on campus to work together remains a significant challenge and investment. Without a single, coherent standard across the industry, integration will remain the task of every individual institution, reinventing the wheel again and again. That means more customizations, more (and more expensive) IT projects that have to be maintained over time, and greater fragility and inefficiency in your overall digital ecosystem. The proposed EDU-API specification will allow for the standardized exchange of data between the transactional systems that manage education administration and teaching and learning. That means not only increased efficiency on campus but the facilitation of the development of a new generation of smart, sustainable apps, personalized based on data about the student, and shared in a secure and responsible way. 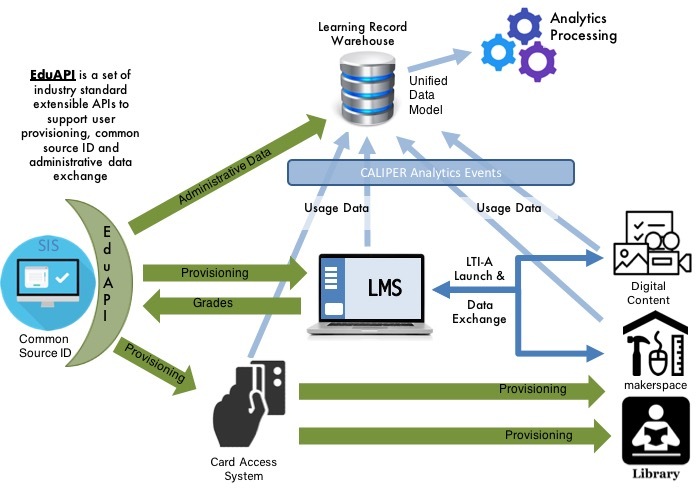 Leveraging the extensive history and experience of past efforts like OneRoster® and Learning Tools Interoperability® (LTI®), EDU-API will focus on meeting the immediate needs of education interoperability while keeping an eye toward future-proofing the solution to ensure long-term sustainability and value. One way to do that is to focus on “emission, not transmission,” defining an API that focuses on the payload and is usable across multiple transport protocols and technologies. Just like when you watch your favorite movie, whether it’s on the big screen in a theater or streamed over your mobile device, the underlying content remains the same. The pace of technological innovation is not slowing down; if anything, it is speeding up, and as new capabilities and solution sets emerge, it is important that a specification—to the extent possible—not be tied to a singular technology platform. Whether working with enterprise service buses, message brokers, or even the emerging category of Integration Platform as a Service (iPaaS), EDU-API will be structured in a way so as to be usable in a variety of infrastructure topologies. That’s even more important as the solutions, applications, and tools that exist in those topologies continue to evolve. As enterprise applications increasingly migrate to the cloud, what does that mean for the availability of data by an institution’s IT developers? With less direct access to data, the existence of robust, flexible APIs takes on increasing importance so that together we can enable the next generation of smart, sustainable teaching and learning technology, personalized with and by data about the student, and accessed in secure and responsible ways to maximize student success. To build an API that services the education community, IMS Global needs the input and participation of the education community! This includes both institutions and edtech suppliers. If you have an interest in working with your peers to help define the next generation of education technology interoperability, contact IMS Global or reach out directly to Cary Brown, director of higher education programs, for information on how to join IMS and participate in the EDU-API Task Force.